The stakes were set high for Archy Marshall last night (October 28) in Montreal. Since the release of his debut LP 6 Feet Beneath the Moon back in 2013, the Brit wunderkind known popularly as King Krule has been riding a wave of undulating praise. Hailed as both fresh and fiercely nostalgic, his music transcends genres, his tracks melding jazz, trip-hop, R&B and post-punk together to create a specific, catharsis-inducing blend inspired by Krule's own sense of loneliness and isolation. For most musicians, translating this kind of music to the stage is a feat in and of itself. But at MTELUS last night King Krule, crowd-pleaser, put on a performance masterclass with one simple formula: keep it punk, make it quick and take no prisoners. 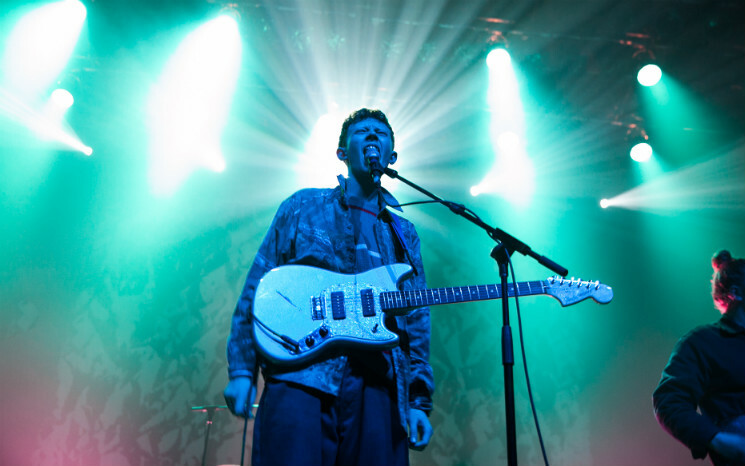 With many in costume for Halloween, the packed crowd seemed both ghoulish and juvenile, bloody vampires mingling with women bathed in glitter, a far-reaching metaphor for Krule's own music. Touring in promotion of his sophomore release The Ooz, Krule and his backing band took to the MTELUS stage and opened with "Has This Hit?" off his debut record. Following shortly with "Ceiling," it became clear that the band had repositioned these normally insular tracks as gritty punk hits, Krule's trademark, abrasive vocals soaring over grating guitar riffs and sharp drumbeats. Opting to have the band backlit without any spotlights on him, or any of the other members, the choice read as egoless, the watermelon-coloured lights casting Krule mainly in silhouette throughout the course of the set. As the evening progressed, Krule and company moved through tracks off both albums; "Dum Surfer" sent the crowd jumping and singing along, while "A Lizard State" made everyone's heads bang with each note from the fat saxophone. Charming and direct, Krule mumbled his gratitude between songs, even coyly wishing everyone a happy Halloween. As the band charged forward, Krule attacked each song like a young amateur boxer in the ring, all lanky limbs and swinging fists — a side of Marshall rarely heard on record, but seen physically when he grips the mic and sings, his face focused like he'll spit in your face at any moment. A somewhat predictable stance for a 23-year-old from South London, it will be interesting to see what age and a bit of finesse will do with such raw talent. Infusing the quick-paced, one-hour set with slow-burners like "Baby Blue" and "A Slide In (New Drugs)" in the latter half, Krule finished triumphantly with "Easy Easy," his biggest hit to date. Coming back on stage for a quick, one song encore — a dessert at the end of a good meal — King Krule finally left, leaving the audience sweating and wanting more.